For Father's Day this year, I wanted to take my dad somewhere a bit different from our usual haunts. My dad is half-Burmese, and I'd initially planned to go to Rangoon House - he's been once and says it was great - but they're unfortunately closed on Sundays. Inkeeping with the Burmese theme, we took a little gamble and googled "Burmese restaurant Melbourne". Burmese House is where we ended up. I only made the booking a couple of days before Fathers' Day, and was surprised by how easy it was to get a table. I must admit I was a bit nervous that the restaurant wouldn't be very good, but I needn't have worried. It was fabulous! Burmese House is on Bridge road, near the corner of Church street. It's the one with the teapot shaped sign. I'd read online reviews that said the upstairs was much nicer than downstairs, so when I booked I requested we sit upstairs. Although when we got there I thought the downstairs looked pretty good too, and I would have loved to watch the chefs cooking. Next time, next time! 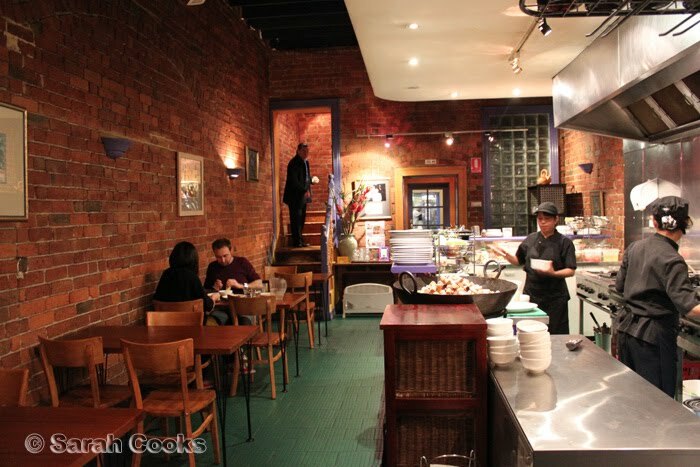 The menu has a mixture of curries, stir-fries, and noodle dishes. 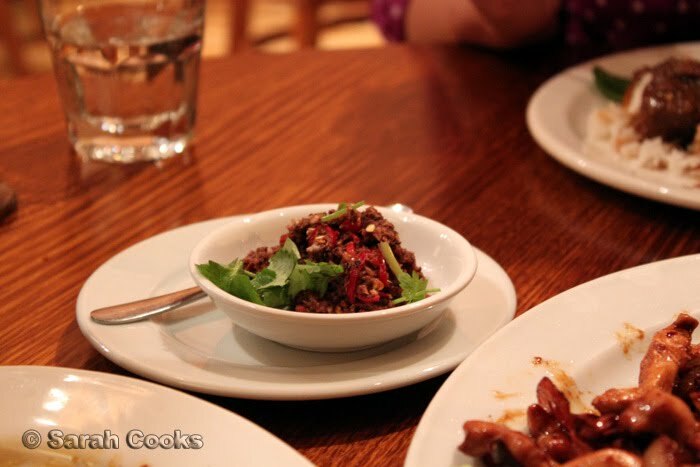 They don't seem to serve pork, so we couldn't order Dad's beloved Burmese pork curry. (His grandma used to make it!) I guess I'll have to learn how to make it myself. 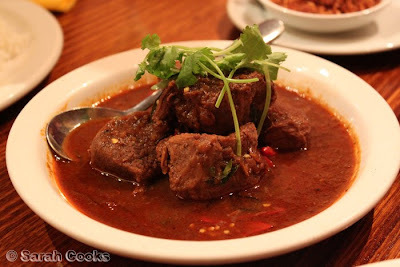 So speaking of which, anyone got a recipe for Burmese pork curry? We started off with a couple of entrées. The roti bread was nice and crispy, and whilst I've come to accept that no roti here will ever compete with the roti back home, Burmese House do a good version. 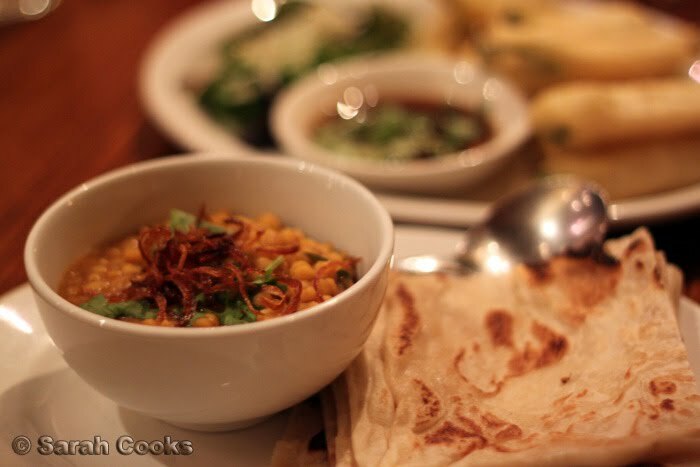 The chickpea sauce was similar to a spicy soupy dahl, topped with delicious crispy onions. On a less celebratory occasion, I'd have been happy to have a big bowl of this to myself for dinner! 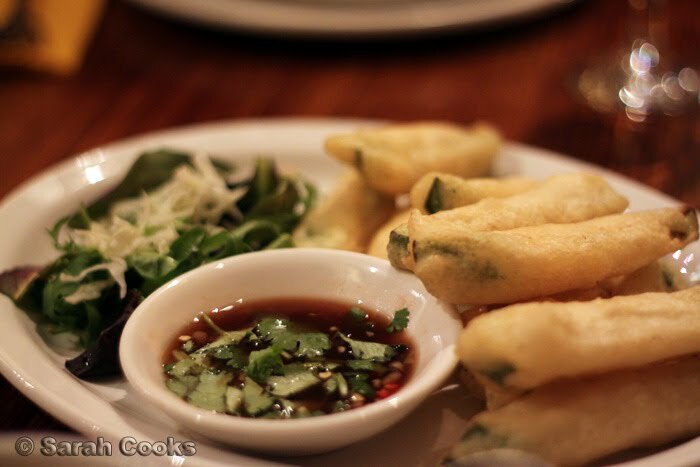 Deep-fried food is usually a safe bet, and these marrow fritters were great! Marrow is a zucchini-like vegetable, and it was cut into thick-ish strips and deep-fried in a light and crispy batter. They were a little bland by themselves, but the sharp and salty tamarind sauce really perked them up. Tender slow-cooked beef, smothered in rich gravy - fabulous. This was my favourite dish of the evening. 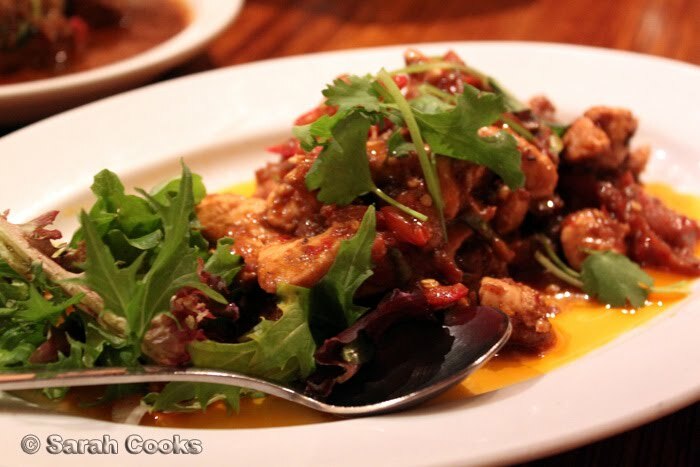 'Chilli chicken' and 'stir-fried chicken with cashew and dried chilli' sounded a bit similar on the menu, but our waitress assured us they tasted different, and indeed they did. 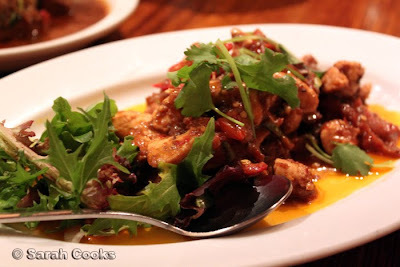 The chilli chicken was like a dry chicken curry, with a lovely layering of flavours. Now, even though we all enjoyed the curries, the stars of the night were the chilli sides we ordered. First up was hot pounded shrimp paste (which I suppose is like a Burmese version of Malaysian sambal blachan), which was, unsurprisingly, very hot! But my parents really, really loved the Balachaung, which they said tasted just like Malaysian "hair ko". 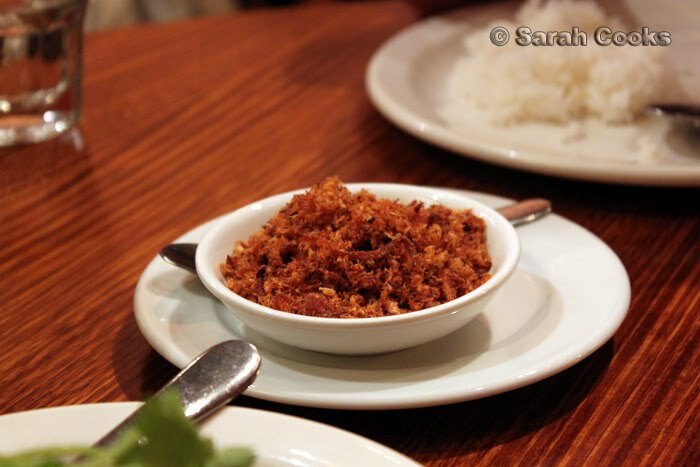 It's kinda like prawn floss, with little pieces of dried shrimp and chilli. Super tasty and addictive! 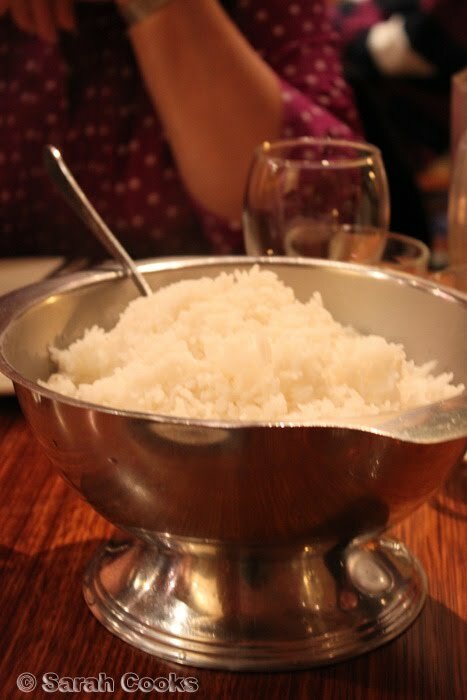 Mum and Dad say this is the type of thing you eat with plain white rice. Another item on my list of things to learn how to make. 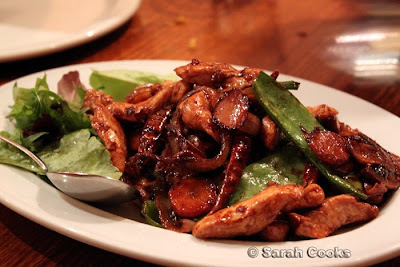 We really enjoyed Burmese House, and I'm really glad we took a chance on somewhere new! We left full and happy, making plans to return. Oh, I loved Burmese house and really should head back there. The last time I was there I fell in love with all the dishes we ordered! 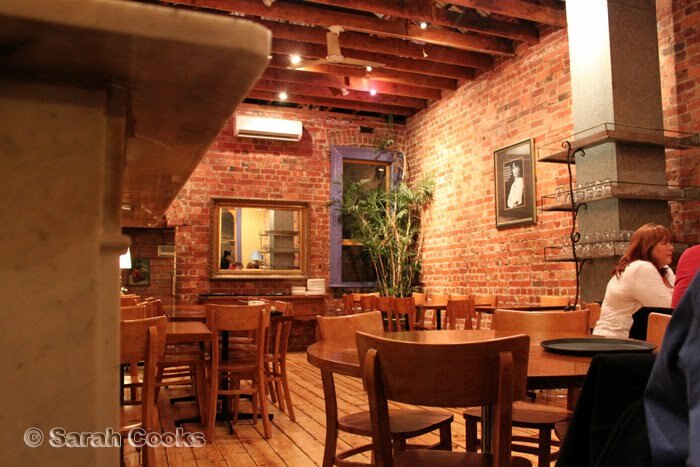 Such an awesome winter place to eat too. Nice! Will love to check out this place. Looks great - I don't know much about Burmese cuisine and your post has made me curious - wonder if there are Burmese restaurants near me in Sydney..
Hiya =) Im Burmese...and all that food from your post made me really hungry. I live in Perth but I dont think we have anything quite as established as "Burmese House" here...maybe just a few grocery stores. Btw, I really love balachaung too.